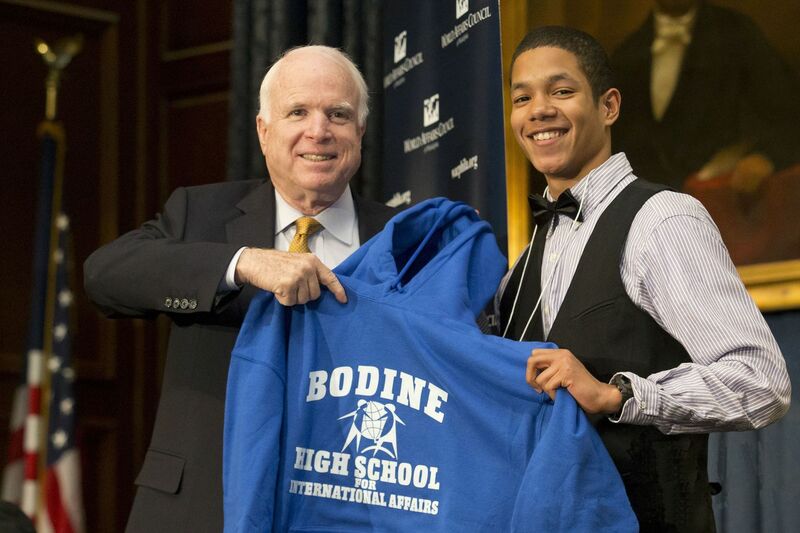 Anthony Williams presents Bodine High School sweatshirt to Senator John McCain at the World Affairs Council of Philadelphia, Dec. 1, 2014. Without foreseeing the scale of the calamity of the Great War, no one hearing the president’s questions that day could have known the true measure of their urgency. But after World War II, community and civic leaders founded the World Affairs Council of Philadelphia, on April 14, 1949. By then, everyone involved knew the urgent answer to the question of the purposes of American power: that this country must lead a world order in which there would never again be a world war. For the past 70 years, the World Affairs Council of Philadelphia has stood for this — that the future of humanity depends in no small measure on the thoughtfulness of the policies of the United States in the world and that the sound decision-making behind those policies depends on civil discourse within our democracy at home. We have pursued this mission with a podium from which presidents and cabinet secretaries, world leaders, and thought leaders of all kinds have addressed every issue of the day. Additionally, we’ve educated hundreds of thousands of middle and high school students about the wider world, innovating in this space as few other institutions ever have: pioneering the model United Nations; founding the William W. Bodine High School for International Affairs, the first public/private partnership school of its kind in the nation; mentoring some of Philadelphia’s most underserved middle schoolers; and offering Pennsylvania’s first commonwealth-wide program for high schoolers to add the credential of “global scholar“ to their diplomas. We have led study tours on every continent, including historic early and extraordinary opportunities for Americans to visit China, Cuba, and Iran. And we have elevated the quality of the content of our live programs through national public television, online streaming, and podcasting. We can now offer the same thoughtful exploration of issues to millions of people around the world that those who attend our programs experience in person. Our goal is to offer the nation an antidote to the present hyper partisan and sensationalized media environment. Seventy years ago, prominent Philadelphians, mindful of the heritage of the city in which the principles of popular sovereignty and inalienable rights had been proclaimed to the world, created an organization whose work has impacted history and whose mission has remained as current as today’s headlines. Just as it did seven decades ago, today, democracy demands discourse.